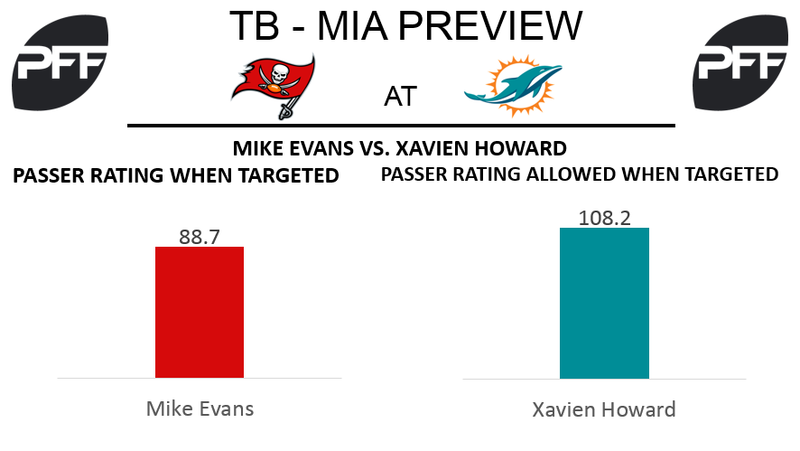 WR Mike Evans vs. CB Xavien Howard – After sitting out last week due to a suspension, Buccaneers’ wide receiver Mike Evans will return to the lineup for this week’s matchup against the Dolphins. Evans has taken a step back from his 2016 form as evidenced by his overall grade of 80.3, which ranks 18th among 112 qualified receivers in overall grade. While his grade is still a respectable number, Evans’ overall grade for the 2016 season was 93.7. He will look to return to his 2016 form this week in a matchup with Dolphins’ cornerback Xavien Howard. Through Week 10, Howard has posted a middling average of 1.14 yards allowed per coverage snap, which ranks 63rd among 116 qualified cornerbacks. TE Cameron Brate vs. LB Kiko Alonso – Despite not often being recognized as a premier tight end, Buccaneers’ tight end Cameron Brate has been one of the more productive tight ends in the NFL this season. Through Week 10, Brate has earned the fifth-highest overall grade among tight ends with a grade of 80.4. The Buccaneers should look to capitalize on a potential mismatch with Brate matching up against linebacker Kiko Alonso. The Dolphins LB holds just a 40.3 coverage grade this year, 68th out of 77 qualifying linebackers. He’s been targeted 48 times and allowed 38 receptions for 385 yards and three touchdowns. Those numbers are good enough for most yards and most touchdowns allowed among 4-3 outside linebackers. When targeted specifically against tight ends, Alonso has allowed a passer rating of 133.9, allowed 18-of-22 targets to be caught for 195 yards and two touchdowns. T Demar Dotson vs. Edge Cameron Wake – This week’s matchup will feature one of the league’s best pass-rushers going up against one of the league’s best pass blockers. 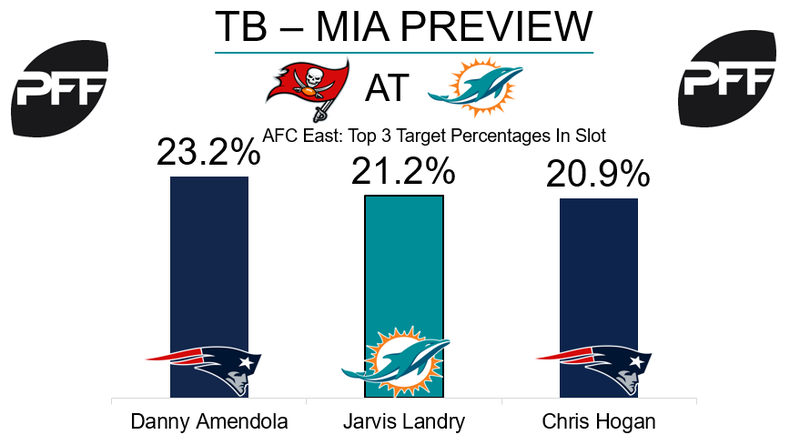 Dolphins’ edge defender Cameron Wake and Buccaneers right tackle Demar Dotson both have graded highly at their respective positions, however, where they really excel is in passing situations. Wake has rushed exclusively from the defense’s left side this season and has turned in the second highest pass-rush productivity rating among edge defenders with a rating of 15.1. Dotson will be up the challenge this weekend, much like he has been all season, as he has earned the second-highest pass-blocking efficiency rating among tackles with a rating of 98.5. RB Damien Williams vs. LB Lavonte David – Damien Williams has been the primary passing down back for the Dolphins, and he has been very effective in that role. He currently has a receiving grade of 81.4, which is 11th out of 51 qualified running backs. However, he will have a tough matchup this week, as he will see a lot of Lavonte David in coverage, who is the second highest graded linebacker at 95.1, and he has the third highest coverage grade among linebackers at 87.7. Last week against the Jets, Josh McCown targeted David four times and had a passer rating of 61.5 when doing so. WR Jarvis Landry vs. CB Ryan Smith – Landry has been coming on strong as of late, as over the last two weeks quarterbacks have a passer rating of 123.3 when targeting him, which is 12th out of 61 qualified receivers. He will have a chance to continue this mini-hot streak against Ryan Smith, who is really struggling this season. His overall grade of 42.1 ranks 105th out of 115 qualified cornerbacks, and he is allowing 1.48 yards per coverage snap, which is 73rd out of 98 qualified cornerbacks. G Jermon Bushrod vs. DI Gerald McCoy – This will be a tough matchup for Bushrod, who is currently ranked 55th among 78 qualified offensive guards with an overall grade of 42.0. McCoy, on the other hand, has an overall grade of 89.3, which is tied for eighth best out of 112 qualified interior defenders. McCoy is coming off a monster week in which he posted an overall grade of 92.2 and had five total pressures, tied for the second most among defensive tackles. This will be a challenge for Bushrod, who has allowed 21 total pressures this season, tied for the eighth most among 77 offensive guards.